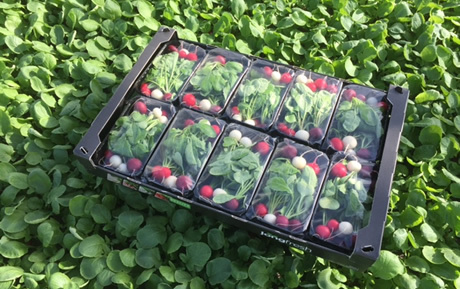 "Rainbow radishes brighten up the shelves"
"Radish production is always low in the winter," says John van Lieshout of the Jongfresh radish nursery. This farm is located in the Dutch town of Monster. "However, the radish market is beginning to gain good momentum as spring approaches. This is mostly thanks to the unusually good weather in recent weeks. This means the radishes are growing nicely again and their quality is excellent." "The volumes are increasing which you can see in the prices. These are currently under slight pressure. Due to Carnival, this time of year is always difficult. You often see sales drop a bit. We can, however, say the market was better than we expected," says John. "The radishes are growing nicely. This means that last week we started harvesting loose red radishes. These are used in cone and kilogram packs. From now, we can also offer French Breakfast radishes in kilogram versions." "People are in the mood for nice weather and bright colors again. We now, temporarily, have this spring mix available for retailers. They can be found in the well-known tray packs. They can be used to quickly cheer the shelves up." "This will only be available from week 12 to 17. It is a special offer for Easter. After that, they will only be available as a loose bunch or in a flowpack. There is not unlimited availability, so when it is finished, it is finished," concludes John.